Sometimes life calls for dramatic eye makeup. We love the ravishing full effect of smoky eyes and long glossy dark lashes for a special occasion or a night out on the town. But what about an everyday stop at Starbucks, a trip to the gym perfectly timed for when that cute guy is sure to be working out, or an afternoon meeting with your boss? For everyday life, natural-looking makeup is most certainly the way to go. And, with a few tips and tricks, you can easily apply makeup which will enhance your eyes naturally without anyone else even knowing you are wearing any makeup at all. But before we get to the makeup, first things first - If your eyes are puffy from lack of sleep, a rough night out, or sensitivity caused by allergens, try soothing them with a cool compress for a few minutes as part of your morning routine. If you don’t have a compress, steep some tea bags, allow them to cool completely in the fridge and then place gently over your eyes. The combination of caffeine and coolness can help to reduce swelling quickly and naturally. Before applying any makeup, always start with freshly cleansed and moisturized skin. This includes using a moisturizer that is meant specifically for the extra sensitive area around the eyes. Apply eye moisturizer very gently using your ring finger and a quick patting motion. Always allow a few minutes for the cream to penetrate the skin completely before applying your makeup. The first step in applying eye makeup? Begin with a concealer made explicitly for the under eye area. We personally adore Trish McEvoy’s Instant Eye Lift as it helps to eliminate puffiness under the eyes and can also help to minimize the look of dark circles. This product also contains vitamin E, which helps to diminish fine lines. If you are especially conscious of dark circles under your eyes, a condition which is often genetic, try Olay Eyes Illuminating Eye Cream. It’s pigmented formula will help to help minimize the darkness. When using an undereye concealer, apply a few dots in an inverted “V” shape to help create a natural look and then gently blend using your ring finger. Next, apply a primer to your lids. A primer allows eye shadow to adhere to your eyelids without creasing and flaking off throughout the day. We like a primer made just for eyes and our fave is Urban Decay Eye Shadow Primer Potion. Use just a tiny dab gently applied to each eye. You can apply using your fingertips, always making sure your hands are clean before touching your face, and then gently blend with a concealer brush. Experts suggest applying a bit of primer under your eyes if you are planning to add a bit of eyeshadow below your lower lash line. To avoid makeup that looks harsh or too dramatic, consider the area of the eye known as the waterline. This often neglected area, where the rim of your eyelids meets your eye can be made up subtly to allow your lashes to look longer. To get this effect, use a black or brown pencil to line the waterlines both above and below your eye. Close your eyes tightly to allow the pigment to adhere to the roots of your lashes, then, use a Q-tip to remove most of the color from the waterlines. Your lashes will look instantly longer and darker. Here's a tutorial showing how it's done! Another tip, use a neutral toned soft brown shadow, one that is just a shade darker than your natural skin tone, and brush it into the creases below your lower lashes. Blend well with a makeup brush to ensure there are no harsh edges. You can also apply a bit of a naturally toned shadow to the center of your lids, brow bone and the very inner corners of your eyes and then carefully blend well with a makeup brush. We love these gorgeous neutral eyes from Fenty Beauty. The most natural way to enhance your eyes, is by applying just a bit of mascara...as nothing screams unnatural like a lot of clumpy mascara, try applying your as shown in the tutorial to avoid any clumps. Your lashes will appear longer and darker, but it won't be obvious to anyone that you are even wearing any mascara. Want to watch a beauty blogger create a natural, neutral look for her eyes? Check out this video tutorial. You may have heard the phrase, “snake venom is a natural product but it can kill you.” Ilia Beauty has built a makeup line based on the philosophy that not every natural product is safe for the skin and not all synthetic products are bad. Ilia features beautiful products that make your skin look and feel great and their eye makeup line is no exception. We love their mascaras, shadows and liners. When you think about makeup made for sensitive skin, drugstore favorite Almay certainly comes to mind. A staple for many years in the sensitive skin arena, Almay is always 100% hypoallergenic, fragrance free and their products are never tested on animals. Two of our favorite products to try... Almay smokey eye trio shadow and Almay mega volume mascara. Think about your daily beauty routine and consider all of the products you use on your face, hair and body. As tempting as it might be after a long day, never ever crawl into bed without first removing all of your makeup and thoroughly cleansing your face. When removing eye makeup, the first rule is to be gentle. Scrubbing and tugging the delicate skin around the eye in an effort to remove makeup will lead to puffiness in the morning and harsh looking wrinkles later in life. For the most natural of eye makeup removers, we just love organic coconut oil. Chances are you already have a jar of this multipurpose wonder product in your kitchen and it makes for an inexpensive and gentle way to remove eye makeup. Simply allow the coconut oil to melt into liquid form in your hand and then gently apply to eyes. Pat with a warm, damp washcloth, rinse with cool water and pat dry with a clean towel. We also like this paraben free cleanser available from Sephora, this product contains honey and other natural ingredients and won’t irritate even the most sensitive eyes. It’s also safe to use if you wear synthetic or natural false eyelashes. Another gentle yet effective eye makeup remover that we like this NARS product contains both aloe and cucumber, two ingredients which help to nourish and calm the delicate skin around the eye. This product removes even stubborn and waterproof makeup and is safe for contact lens wearers. Have you heard of Micellar Water? Originated in France, this product looks, smells and feels like regular tap water but is actually an all in one makeup removing powerhouse. Micellar water is gentle enough to use on the eyes but we love its ability to remove makeup, cleanse skin and tone. And the best part? You don’t even need to rinse your face after using it. Just use a cotton ball and bang, you’re finished and ready for bed. And finally we love everything about Jessica Alba's brand AHAVA. 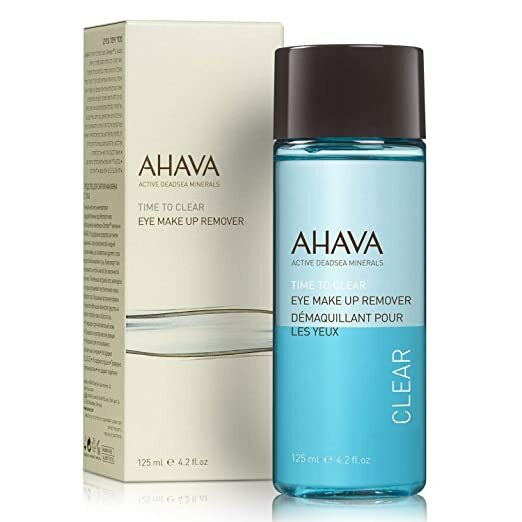 This eye makeup remover quickly and effectively removes stubborn eye makeup without leaving skin feeling slick or greasy. This product is a must try for anyone suffering from oily skin. Our eyes are delicate areas that must be cared for gently. Always remove makeup using a gentle and natural makeup remover designed specifically for the eye area. Moisturize each morning and night before applying concealer, primer, shadow, liner or mascara. When just a bit of makeup is applied properly your eyes will pop and no one will ever know you’re wearing even a stitch of makeup. If your mornings are anything like mine, you'll wake up feeling hectic and rushed.